Nowadays, with the climate change and sustainable development being at the spotlight, I would like to write about the adaptive reuse. You may quickly grasp the concept only reading these words but, just in case, I will answer the following question for you: What does adaptive reuse is? In general, we understand that it “is a process that changes a disused or ineffective item into a new item that can be used for a different purpose”. Here the concept of circular economy is now being heard. 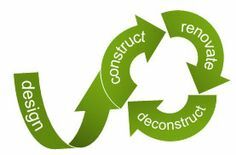 The main point in this economic sustainable view is the 3R’s (Reduce, Reuse and Recycling). We can get off it to find new life in everything from bottles, clothes, boxes, vehicles, buildings and so on. I can see that this can be greatly translated to the “adaptive reuse” concept. As I said, we can try to adapt almost everything, but today I would like to focus in the last that comes to mind here: the building sector. We live and spend the majority of our time inside, so without sustainable buildings it is difficult to achieve a sustainable development. Buildings will have to be adaptable to the changing needs of the users. Flexibility in design, materials and thorough planning is the key. However, what happens if it is a building that already exists and was not planned according to these new needs? Then it is necessary to pursue a way which is sympathetic to give it a new purpose. All over the world, we find buildings which are abandoned, left unattended and unmaintained, causing a rapid deterioration and space misuse. Therefore, when a building can no longer function with its original use, a new use through adaptation may be the only way to take advantage and preserve it. We could say that the Reduce, Reuse and Recycle concept is applied here, because we consider that we preserve the building and there is no need for demolition and to build a new one. As a result, bypassing the wasteful process of demolition and deconstruction we alone see the benefits that this adaptation has for the environment. However, we could go further and prove that adaptive reuse is an essential component of sustainable development because it provides social and economic benefits as well. Let’s present it: In the social side, the recycling and adaptation of a building can restore the heritage significance of it as well as new housing or commercial or cultural opportunities to the community. Finally, in the economic side we have obvious savings for not having to acquire all the resources, materials and machinery to build a complete new building along with the embodied energy savings from not demolishing it. Is it good, isn’t it? It is like reinventing recycling. To end, one great example (and a favourite of mine!) of adaptive reuse in buildings could be the transformation of the former Bankside Power Station in London to the art gallery Tate Modern. In a short span of time, Tate Modern has changed London and revitalised a previously underdeveloped area helping give the city a new image. It has become a key landmark for London skyline, while its concept and architecture have won international acclaim. As Viollet-Le-Duc said, “the best of all ways of preserving a building is to ﬁnd a use for it, and then to”.